Turkey’s Recep Tayyip Erdogan has suffered a blow in local elections, with his party losing control of the capital Ankara and an opposition party also claiming victory in Istanbul. “If there are any shortcomings, it is our duty to correct them,” he said. More than 57 million people in the country were registered to vote for mayors and Councillors. 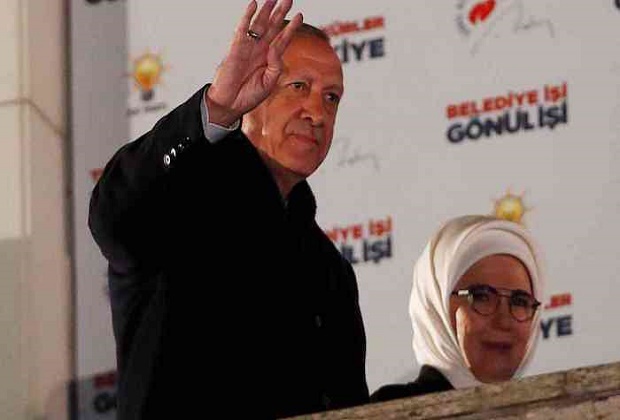 Mr Erdogan had previously said the poll was about the “survival” of the country and his party, which has dominated Turkish politics for 16 years. Turkish media said the secularist Republican People’s Party (CHP) candidate Mansur Yavas had won a clear victory in Ankara. However both the CHP and Mr Erdogan’s Justice and Development Party (AKP) claimed victory by a slender margins in Istanbul, the country’s biggest city. CHP candidate Ekrem Imamoglu said he had won by nearly 28,000 votes while the AKP said its candidate, former Prime Minister Binali Yildirim, was ahead by 4,000 votes. Both candidates reportedly received more than 4m votes each. The CHP also said it had held Izmir, Turkey’s third largest city. “The people have voted in favour of democracy, they have chosen democracy,” CHP leader Kemal Kilicdaroglu said. Meanwhile Mr Erdogan, speaking to supporters in Ankara, hinted that the AKP may have lost control of Istanbul. “Even if our people gave away the mayorship, they gave the districts to the AK Party,” he said. He vowed to focus his leadership on the Turkish economy ahead of national elections scheduled to take place in 2023. Prominent journalist Rusen Cakir said the vote was “as historic as that of 1994”, referring to the year Mr Erdogan was elected mayor of Istanbul. “It is a declaration that a page that was opened 25 years ago is being turned,” he said, according to Reuters.